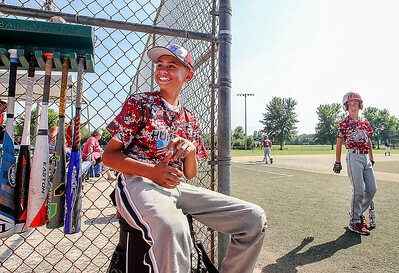 Sarah Nader- snader@shawmedia.com Huntley Red Raiders' Tyler Castro, 12 watches his teammates hit during Monday's 11U MCYSA Summer International Baseball game against the NSBA Hawks July 27, 2015 at Lippold Park in Crystal Lake. 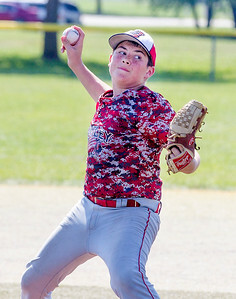 Sarah Nader- snader@shawmedia.com Huntley Red Raiders' Johnny Persino, 11, pitches during Monday's 11U MCYSA Summer International Baseball game against the NSBA Hawks July 27, 2015 at Lippold Park in Crystal Lake. 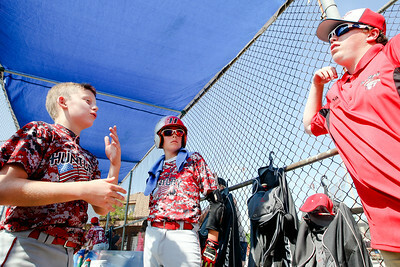 Sarah Nader- snader@shawmedia.com Huntley Red Raiders' Jake Leonard (left), 11, and Aidan Giebelhausen, 12, practice new hand signals with Tyler Schoemann during Monday's 11U MCYSA Summer International Baseball game against the NSBA Hawks July 27, 2015 at Lippold Park in Crystal Lake. Huntley Red Raiders' Tyler Castro, 12 watches his teammates hit during Monday's 11U MCYSA Summer International Baseball game against the NSBA Hawks July 27, 2015 at Lippold Park in Crystal Lake.